Julian Assange has been called in by US Senate Intelligence Committee to testy in the alleged Russian interference in the 2016 election. 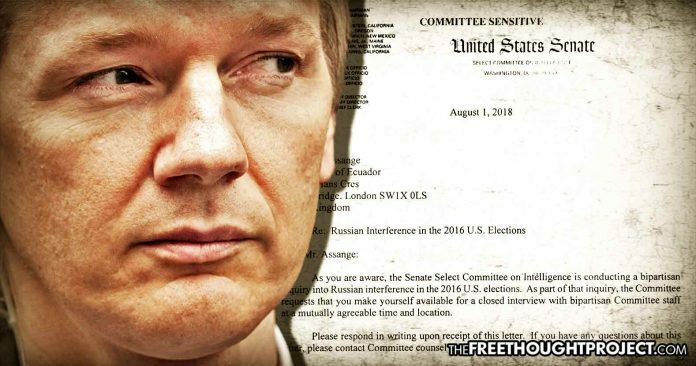 Washington, D.C. — (RT) The US Senate Intelligence Committee has requested that persecuted WikiLeaks editor Julian Assange testify before committee staff. The committee is investigating alleged Russian interference in the 2016 election. Assange fled to the Ecuadorian embassy in London in 2012, seeking asylum from possible extradition to the US, where he faced indictment under the Espionage Act for publishing leaked government documents. Since his de-facto house arrest in the embassy, WikiLeaks has continued to draw controversy, publishing then-candidate Hillary Clinton’s emails and leaked emails from the Democratic Party’s internal servers in 2016. Over a month before the Senate Intelligence Committee’s letter arrived in London, ten Democrat senators sent a petition to Vice President Mike Pence, demanding that he press the Ecuadorian government to revoke Assange’s asylum.